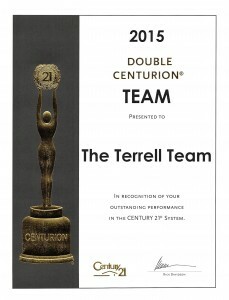 For the second year in a row, The Terrell Team has been declared the Top-Selling Century 21 Team in 5 States! The Terrell Team has had an overall survey satisfaction score greater than 95% for at least two consecutive years, conducted by and independent third party company “Real Satisfied”. 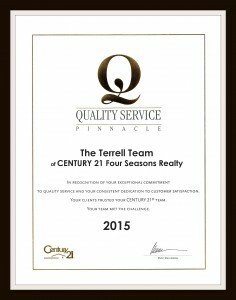 By achieving both the Quality Service Pinnacle Award and the Centurion Award we receive the Century 21 President’s Award, Century 21’s most prestigious award. 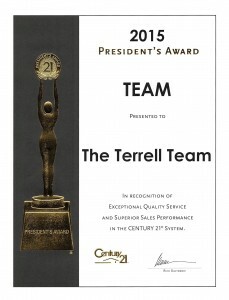 This is the second year that the Terrell Team has received this award, and personal recognition from the President of Century 21. Awarded “ALL STAR” Award for Our Monthly Newsletter by the Internet marketing Company, Constant Contact. This puts the Terrell Team in the top 10 percent of hundreds of thousands of international companies! Thank You to Our Team of Agents and All of Our Clients!